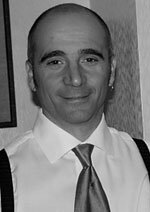 Born in Toronto on November 13, 1959, Olindo Chiocca studied enginnering, worked in hi-rise constructiion then got sick of the long hours. He then decided to move to Nelson for a slower lifestyle and took up writing as his part-time passion. He says he stuggles to do as little as he can and still get away with it. Much of the bronfman fortune in Canada was made during Prohibition by selling Canadian booze to American bootleggers such as Meyer Lansky, Moe Dalitz and Lucky Luciano; they became the American Mafia. "I never went to the other side of the border to count the empty Seagram's bottles,"; said Samuel Bronfman. When Prohibition ended in 1933, the U.S. demanded $60 million in taxes from the Canadian liquor suppliers, but they eventually lowered Bronfman's bill to $3 million "of which Bronfman graciously allowed the Canadian government to pay half,"; says Olindo Romeo Chiocca of Nelson. The only book of its kind in the world, Dinner Wit Da Dons is a twisted gastronomic look at the links between the early American Underworld (1890-1959) and traditional Italian cooking. Olindo has packed his cookbook with Italian recipes and a litany of mobster crime facts, scenes, profiles and quotes from some of the most notorious Mafia and underworld gangsters ever to drop dead on the pavements of New York and Chicago. With his book you can become the undisputed Don of Mob Trivia, using it to help you plan your next gangster dinner party. With recipes like 'Two Guns' Tagliatelle', 'Bullet Spitt'n Croquettes', 'Tammany Hall's Stuffed Tomatoes', and the 'The Four Deuces Lemon Cake', you'll have friends and one-time casual acquaintances sending Sammy the Shiv over to 'kindly' remind you that they should be invited to your next Mob Don Do. Meet and get to really know the criminals, politicians, judges and lawyers who helped make organized crime the huge success that it is today. Some of the luminaries include Al Capone, Dutch Schultz, J. Edgar Hoover, Gyp DeCarlo and Jimmy E. Coli. Also jammed into this book are Mobster Profiles, Uninvited Dinner Guest Scenarios, a Rogue's Gallery, Dutch Schultz's last words, and piles of other facts. Sixteen sections in all with over 165 recipes, 200 mob vignettes and an endless number of quotes. Dinner wit da Dons is available at Otter Books in Nelson, or can be ordered at mafiacookbook@uniserve.com. Just email Olindo and he'll get back to you.